After our day in Monduli, we returned to Arusha Monday night and spent all evening sorting through our stuff, separating the things we would need for our eight-day trip through the national parks from the things we could leave until our return. About half of our luggage and a lot of the things we had brought from the U.S. for Joni were packed away and left for later. What was left still looked like too much. After the blissful experience of the previous day’s run in the hills outside Monduli, my three-mile run in Arusha was a hard return to reality. I struggled to get out of bed, and pulled on my running stuff with an utter lack of enthusiasm. As I ran along the now familiar main highway, the air seemed dirtier and the road surface harder. Other than that, the run made no impression on me, and I devoted one listless sentence to it in my journal. Of course, with a nearly year old running streak on the line and only a few days left to claim the accomplishment of running every day of 2010, there was never any doubt that I would do the run. But as I trudged joylessly up the hill back to L’Oasis, I supposed that if the streak hadn’t been there, I would just as soon have slept in. When I got back, instead of a leisurely breakfast, I had to hustle to take a quick shower (my last for a while), and eat a hasty plate of toast and fruit. This was the first day of our journey into the national parks, which meant the first day of stuffing ourselves and our belongings into (or on top of) the land rover. The land rover would become our home away from home, not only our transportation but our only protection from the predators whose domain we were about to invade. Rob, Peter (our driver), and Henry (our cook) appeared on schedule at 8 a.m. It took about 30 minutes to pack everything, and then we were off. Well, sort of. Before heading out-of-town, we first drove back into the city to pick up supplies and other last-minute necessities. These included cases and cases of water, several dozen eggs, and various other sundries. In addition to the collective supplies, this was our last chance to get personal items. For Joni, this meant buying more air-time for her cell phone (yes, there is cell phone reception in parts of the Serengeti). For Loren, this meant getting the next volume of Stieg Larsson’s Millenium trilogy. For me, it was a slim book called “Beginning Swahili,” which would become my constant companion for the next week. Loren in the Land Rover. With the shopping, and various other delays, we didn’t leave Arusha until well after 10:00 a.m. Our plan was to pick up Oju, who would accompany us to Tarangire National Park where we would camp for one night. We would then drop him at a spot where he could get a dala dala back to Monduli and we would continue, first to Lake Natron and then to Loliondo and the Northern entrance to the Serengeti. The drive to Tarangire was uneventful except for a stop we made at a small roadside market. Within seconds of the land rover pulling to a stop, it was surrounded by a crowd of Maasai women pressing up to the windows with necklaces, bracelets, and other handmade items. We had been told that this was likely to happen, but being told hadn’t really prepared us. I didn’t want to buy anything, and after exhausting my repertoire of ways to say “no, thank you, I don’t want any,” I gave up and turned back to my Swahili book. The irony of the moment would weigh on me for several days. As the trip went on, we became more and more immune to this kind of interaction with the Maasai. That is, we learned to be indifferent. We arrived at Tarangire a little after noon and waited for what would become a familiar twenty-minute ritual of having Rob pay our fees to enter the park. Why it should take so long was never clear to me, but I decided I didn’t really want to know what was involved and whether it involved corruption of some kind. Anyway, having obtained the necessary permission, we drove for about 15 minutes to a campsite and dropped off Henry and all our gear. Then we started the first of many game drives. I am not going to recount every new animal sighting. It would be time-consuming for me and boring for my readers. I will say that Rob had set up our trip with the same kind of genius that you see from those who design programs for fireworks. With each new place we drove, there was something new to see, something more exotic than the last place. It seems comical now that our first sighting of a giraffe was an occasion for ten minutes of taking pictures. In the coming days, the sight of a giraffe here or there would become almost commonplace, and might inspire a casual remark, but little more. So too, with baboons, zebras, bearded gnus, and even elephants, although it’s hard to get used to elephants. 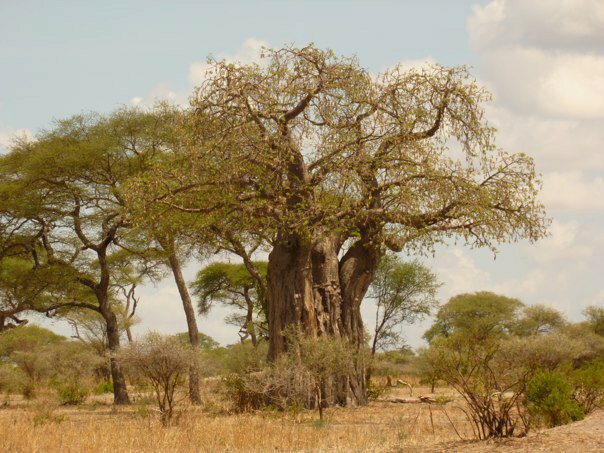 Anyway, the highlights of this drive were our first sightings of all of the above and more; our lunch stop where we matched wits with the sneaky, thieving vervet monkeys; and the baobab trees. I never got tired of elephants or baobabs. Baobab tree at Tarangire National Park. As the sun went down, we returned to our campsite. This was our first sunset outside the city, and the views were stunningly beautiful. I’ve included a picture, below, showing the road to our campsite. It was late when we got out of the land rover, and we ate our dinner by torchlight. Before crawling into sleeping bags for the night, we were given a stern lecture by Rob about not leaving our tents in the dark. I won’t repeat his instructions about what to do in case we felt we couldn’t wait until morning to relieve ourselves. Anyway, his talk ensured that I would spend my waking moments, and there were many, listening for the sound of animal incursions into our encampment. It was a long night. I was very happy when it finally began to get light. Our tents had been hot and stuffy and it had taken a while to figure out how to ventilate them properly. Ann had fallen asleep quickly, but I lay on my back for what seemed like hours trying to think cool thoughts and trying not to listen too carefully for the sounds of large animals in the night. It didn’t help recalling Rob’s words of caution should we happen to feel the “call of nature” before it was light enough to safely cross the campground to the toilets. I don’t know how the others felt, but being told that I was confined to the tent for the next eight hours made me anxious and restless. As a result, I slept fitfully, and it was a great relief to have the sun finally come up, and to be able to climb out of the tent, stiff and groggy but un-mauled and ready for another day. As far as running went, this would be the first real test to judge whether it would be practical for me to run while inside the parks. Both Rob and Joni had been skeptical, considering that Rob would not sanction me venturing outside the campground for any reason. I understood that he had no desire to lose a client to a freelancing lion who might pass by while I was doing my best impersonation of breakfast. It would not be good for business. On the other hand, I had three days to go to complete the streak, so I was prepared to make severe compromises. I had already decided that the morning’s run would consist of running up and back the campground access road, a strip of soft dirt that extended perhaps 150 meters from our tents. On the near end of each lap, I could circle the tents and the small pavilion that the cooks used to prepare meals. On the far end, I could take a wide turn around some bushes on either side of the road — not much different from the turns we used to run around the old Newton North indoor track. Plus, I would have company. When I had described the plan the previous evening, Oju had said to wake him up for the fun. So it was that as the sun rose on Tarangire, we set off together at a sleepy jog, our first tentative steps taking us away from the safety of the central campground and our cluster of tents towards the bush, and then as we approached the edge of our tiny island of human habitation, turning back again to complete a lap. The goal was to continue for as many laps as it would take to log twenty minutes. All year that had been the informal minimum I had established to “count” as a run. Our first lap felt pretty tame. Having to turn around so soon after we started was drudgery. Returning to circle the tents barely a minute after we had left made us objects of amusement for our traveling companions and crew. On the first lap, I felt self-conscious, but soon I had other things to think about. At the far point of our second circuit, I looked out beyond the road and realized that there were hundreds of baboons foraging in the bush not more than 200 meters away. A shot of adrenaline went through me, and I experienced the visceral sensation of the wildness surrounding us. There was nothing separating us but dry grass and a few acacia trees. It was, I thought, very fortunate that the baboons had no interest in us. Newly alert, we continued our laps, even finding ways to make our run more playful. We started weaving through the campground, bounding up the steps on one side of the pavilion, crossing it, and leaping off the other side, then heading out to the end of the access road and the indifferent baboons, and then back a minute later. After twenty minutes of this, I decided we needed to do one more lap, so we did, and finished without fatigue or distress. Rob, who had been watching us with the same concern that a mama bear might have watching her cubs wandering away from the den, gave us a broad smile. I’m not sure he approved, but he seemed to accept that this was what we did to amuse ourselves. Having survived the night and the morning run, we sat down to a sumptuous breakfast, the first of many miracle meals that Henry would prepare for us in the bush, this one providing our first taste of his sublime pancakes, as well as omelets, and of course fruit and camp coffee. Then we were off, packed into the Land Rover and heading North to Lake Natron. This entry was posted in Tanzania and tagged Tanzania, Tarangire. Bookmark the permalink.